Activities this week in the Flemish town of Kapelle-op-den-Bos represented a paradigm shift not only in the capacity of local people to impact on the asbestos disaster which has befallen their town but also on the political attitude of the municipal authorities.1 Kapelle asbestos victims and family members working with ABEVA, the Belgian Association of Asbestos Victims, organized a series of first-ever events on June 23 to highlight the ongoing effects of decades of asbestos-cement production at the Eternit factories in their town. 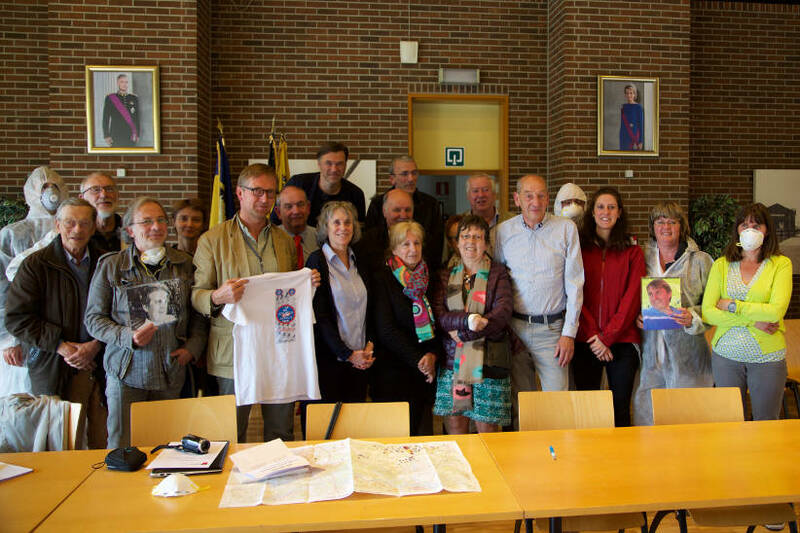 On that day, the Mayor of Kapelle Edward De Wit received an international delegation at the town hall. The discussions, in Flemish and English, were wide-ranging in a session which lasted over an hour. During that time, Kapelle citizens were able to put questions directly to the Mayor. 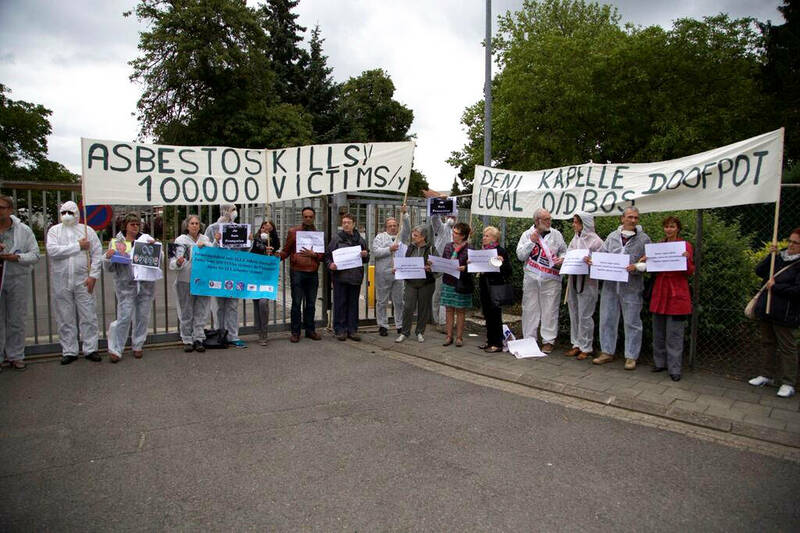 This had never happened in the almost one hundred years that Kapelle had been the center of Europes asbestos-cement industry. 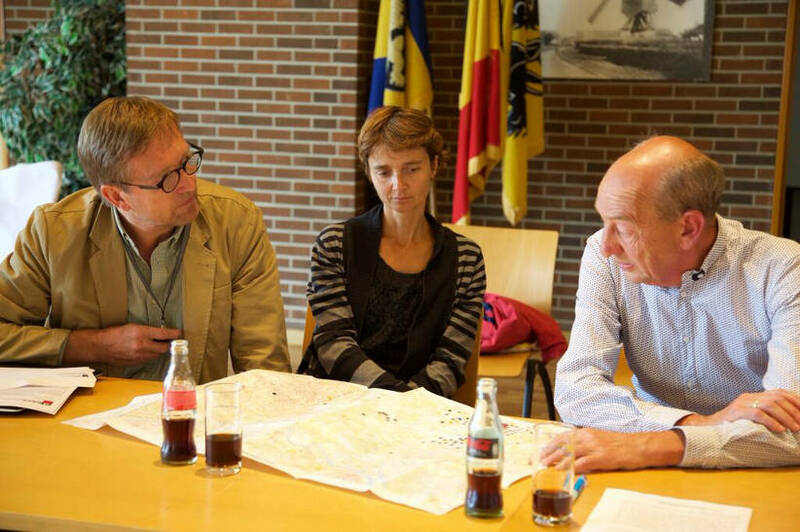 From left: ABEVA President Eric Jonckheere and former Kapelle resident, translator, and Mayor De Wit. A longer report will provide more information on the substance of the discussions which took place in due course. After the meeting, there was the first ever demonstration outside the gates of the Eternit site. 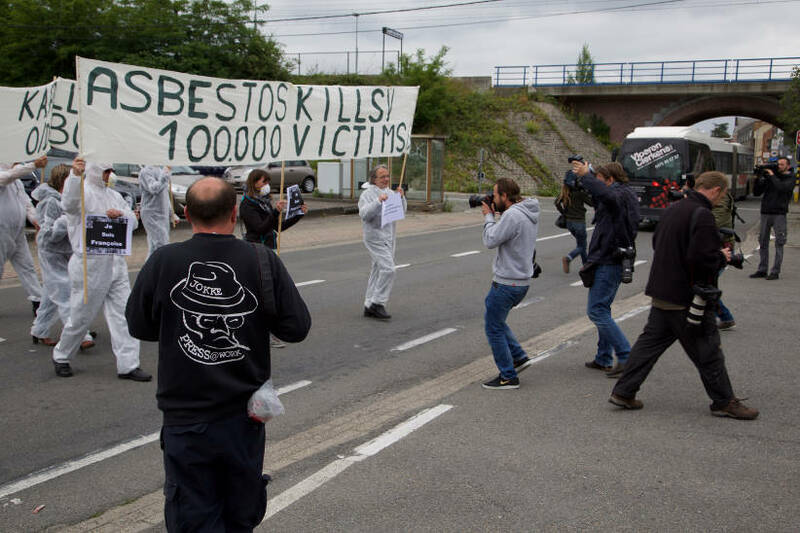 Despite the high incidence of asbestos mortality in Kapelle, Eternits political and financial power as the towns biggest employer and one of the countrys biggest industrial conglomerates had always prevented such a public display. 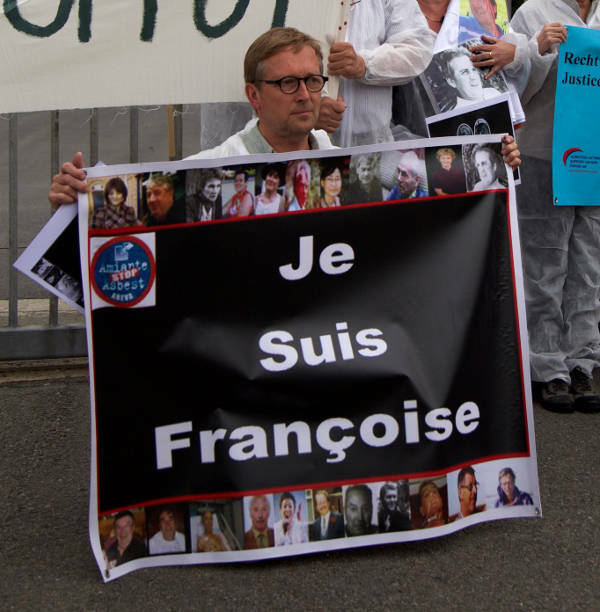 Holding their colourful multilingual banners, the demonstrators wore face masks and white decontamination suits to highlight the residual legacy of asbestos pollution of Kapelles infrastructure, soil and air. Following the demonstration and the impromptu press conference, the Kapelle residents invited the international guests to take part in a tribute to the victims at the local cemetery. 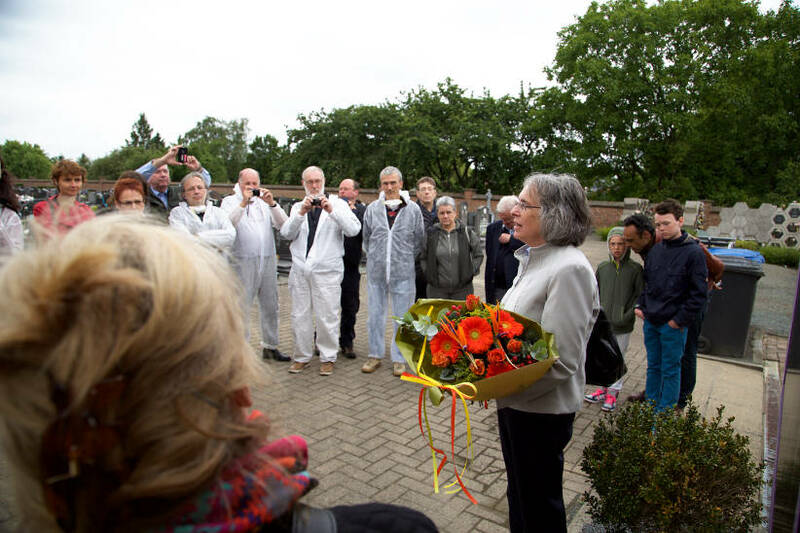 After flowers were laid by a Kapelle resident, the international guests expressed solidarity with the campaigners and laid their floral tribute. Panel 3: Examples of best practice for asbestos removal. 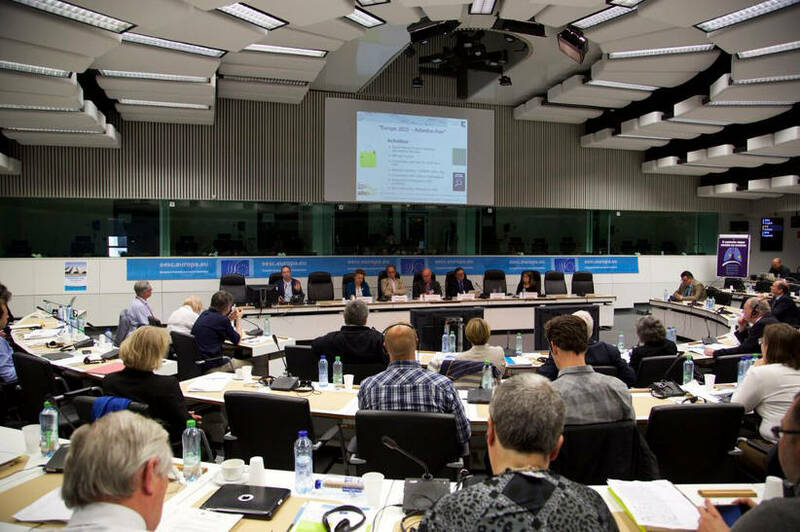 Ms. Renstrom, Co-Chair of the asbestos hearings, was in no doubt about the scale of the EUs asbestos problem and the urgency with which it should be addressed: We need to act yesterday, she told delegates in the final session of the conference. Her statement and her demand that we need to stop passing the buck were loudly applauded. There is more to follow. 1 Kazan-Allen L. Europes Asbestos Ground Zero. June 22, 2015. 2 Asbestslachtoffers bezoeken Eternit in Kapelle-op-den-Bos [Eternit asbestos victims visit Kapelle-op-den-Bos]. June 24, 2015. 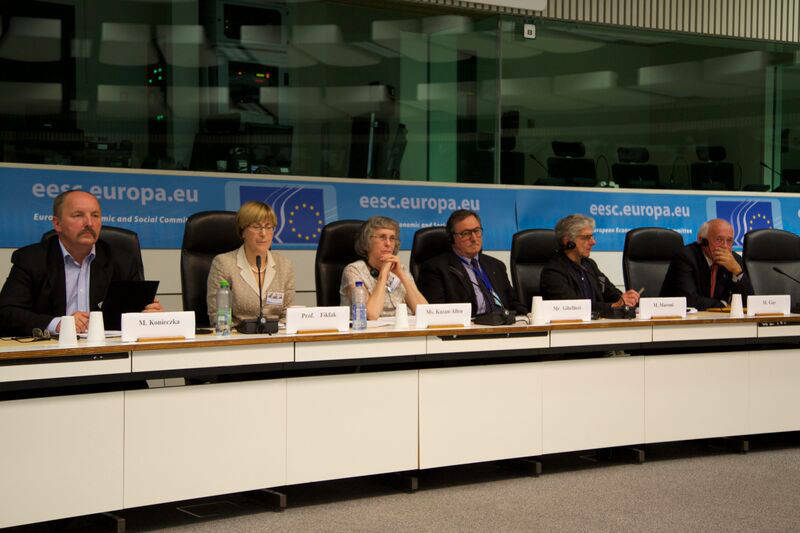 3 The EESC is the consultative body of the EU representing European civil society organizations; the CoR is the voice of regions and cities in the European Union. 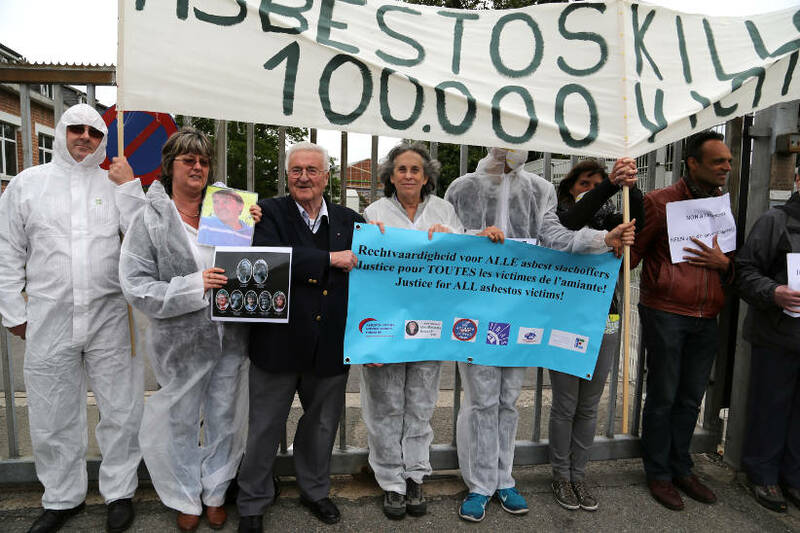 5 European Committees raise alarm on Europes silent epidemic: Asbestos-related deaths predicted to double those of road. June 25, 2015. 6 Van den Borre, Deboosere P. Enduring health effects of asbestos use in Belgian industries: a record-linked cohort study of cause-specific mortality (20012009). June 24, 2015.